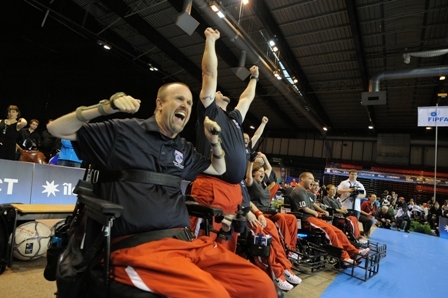 Chris Finn celebrates Team USA's win at the World Cup. Comcast and Bay Area News Group hosted their annual celebration of “Hometown Heroes” last Thursday and Chris Finn was one of the honorees. It was great to see Chris (and all the heroes) be recognized by the local media for their contributions to the community, and in Chris’s case, his work with BORP and Power Soccer. 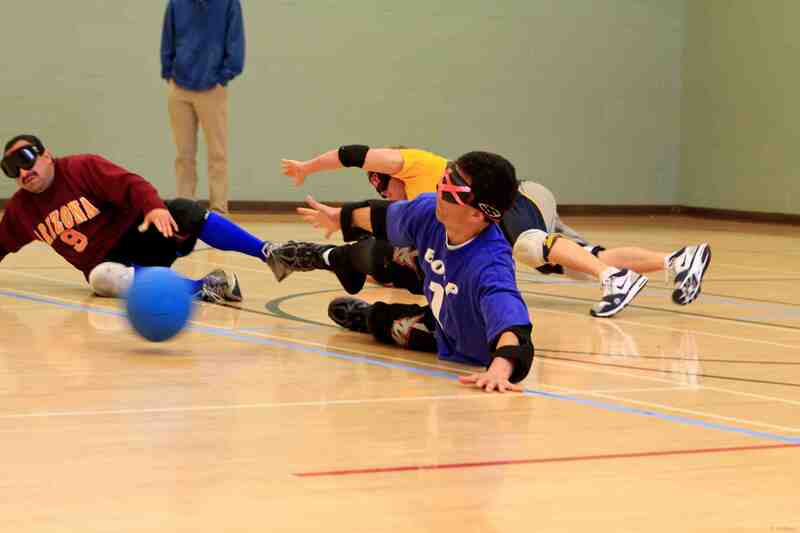 BORP Goalball hosted a one day tournament at James Kenney Recreation Center on Saturday, March 24. Offense had the upper hand all day and goals were scored at almost a 1 per minute rate! Royal Flush behind the 1-2 punch of Joe Hamilton and Victor Hakopian ended up at the top of the pile with a 4-0 record, while Beauties and the Beasts, Invisible Pink Unicorns and Team No Name all finished 2-2. 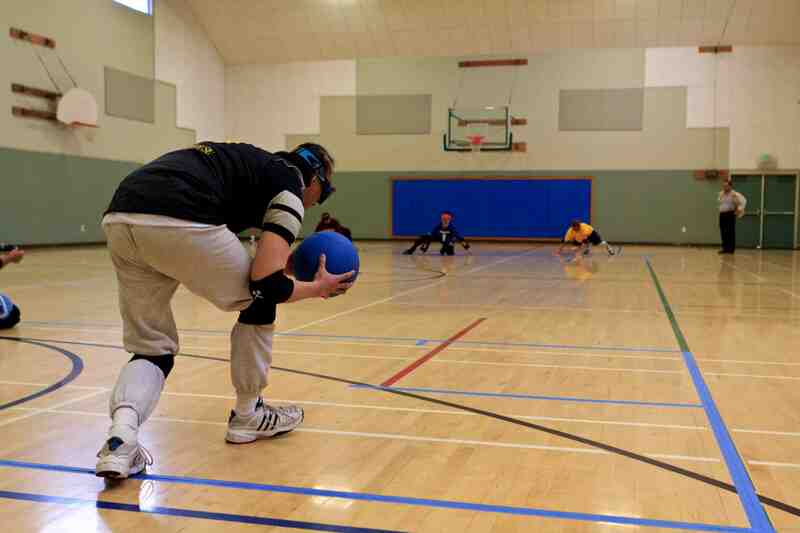 Thanks to the volunteers, players and coaches for an exciting day of Goalball! All 3 of BORP’s power soccer teams were in action last weekend. The Bay Earthquakes hosted the San Jose Steamrollers and the Hollister Free Wheelers and the Bombers and Crushers traveled to Fresno. The Earthquakes and Steamrollers started off Saturday with a tense contest that ended 0-0. In their second game of the day the Earthquakes took on Hollister and the BORP side got their attack going early. However Hollister’s defense was up to the challenge and the Free Wheelers showed some offensive firepower of their own taking a 1-0 lead. >From then on it was all Earthquakes as John Madigan scored a hat trick off great passing from Brandon Johnson and Anh Nguyen. Lateef McLeod and newcomer Vasilis Rousseas took turns patrolling the goal area for the Earthquakes and anchored a solid defensive effort and a 3-1 victory. 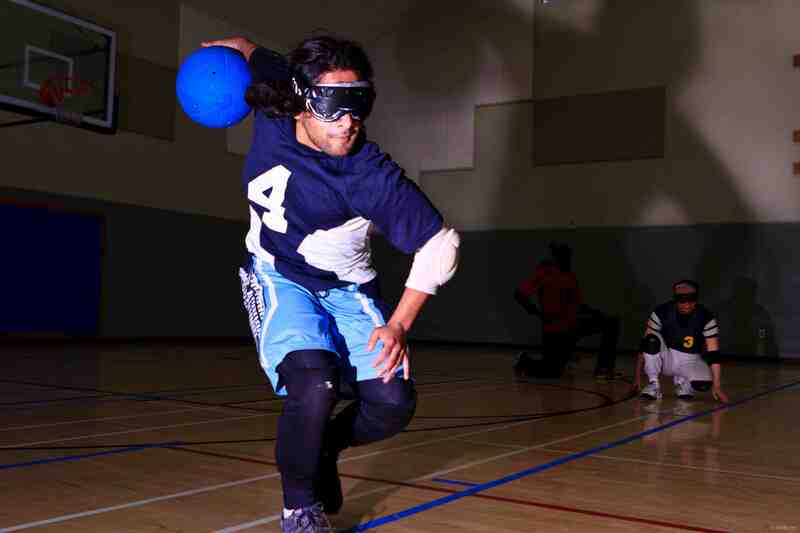 Game 3 saw a rematch of the Earthquakes and Steamrollers and a similar result to their first game. An early goal by John Madigan (his 4th) was matched by a second half tally from the Steamrollers and the final result was 1-1. The Fresno team, the Central Valley Ghostriderz hosted the Crushers, Bombers and San Jose Rockets on Sunday. This was the first time for the Ghostriderz to host and they did an excellent job! 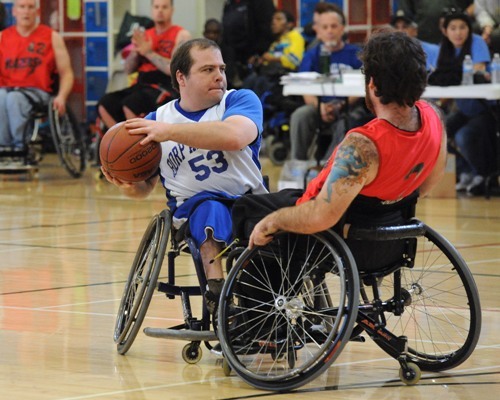 The tournament featured a round-robin format and a first game match-up between the Bombers and Crushers. The Bombers behind a, you guessed it, hat trick from John Starks, won their first game of the season 3-0. Sebastian Klopfer made the defensive stop of the game saving a sure goal right before the final whistle to preserve the shut-out. While they lost their other 2 games the Bombers showed skilled and resolute play throughout the day and will be a tough match-up for any opponent going forward. Edana Contreras was on the front end of several great plays including two of John Starks’ 4 total goals. Jessica Roekl-Navazio and Chanelle Stallmeyer were instrumental in providing support off the ball and keeping their opponents in check. The Crushers had a hard time getting going in their second game and fell 3-0 to the dynamic San Jose Rockets. The final game of the day paired up the Ghostriderz and the Crushers and based on the early results of the day the host team had the advantage. However Coach Finn finally found the energy switch on the Crushers machine and a dormant offense and passive defense came alive for the most exciting contest of the day. Ian Kinmont got the Crushers going in the first half with the first Crushers goal of the day which was answered swiftly by the determined Ghostriderz. The half ended 1-1 and the scene was set for a nerve-wracking finish. The second half started strong for the Crushers as Ian Kinmont scored the Crushers second goal and April Bryant converted a brilliant pass from Margaret Mele for Crushers goal #3. The BORP fans went bonkers after this play and it seemed that victory was secured as there were only 3-4 minutes left. However at this point the Ghostriders found their 5th gear, scored a second goal and had the ball non-stop in the BORP goal area throughout the final minutes. Goalkeeper Jake Bath came up HUGE during the relentless onslaught and the game ended 3-2 Crushers! Wow! During the game, Margaret Mele contributed 2 outstanding assists and non-stop floor leadership and her protege Ruby Shemaria also came through with a sweet assist. Stephen Dysktra and Jake Bath had great days in goal and Milo Balcziunas was a solid presence in support of the Crushers offensive and defensive strategies. Thanks to all the volunteers, friends and families who contributed to a wonderful weekend of Power Soccer! It is with great sadness that I report the passing of BORP power soccer volunteer, Kevin McGown. Kevin passed away from a sudden illness on Monday night. He was at the gym all day Saturday helping with guards and equipment and reffing and it just doesn’t seem possible that he is gone. Kevin’s generous spirit, kindness, intellect and good humor will be missed tremendously by all of us. A poem as spoken or written breath. Yoga as a way to find your breath. Breath and words as the currents we move with. Find your poetry in motion with us! Adaptive yoga teacher Nancy Yates teams up with poet/disability practice artist Amber DiPietra to offer this unique yoga and creative expression workshop. You do not need to be a writer or yogi to attend! Only ready to be bodies in warm, open space with us! Cost: $20 or ask about sliding scale option. RSVP amberdipietra@gmail.com, 415 867 1124. I hope this update finds you all well and ready to welcome Spring. Of course as I write this the forecast is calling for cooler temps and rain. Wishful Spring thinking on my part. Here is the latest news on the BORP fitness front. We have added another new Zumba class. This one is Zumba Gold and it is specially designed for seniors and anyone looking for a low impact, fun, latin style, workout/dance class. Yes it’s all of those wrapped into one. Thalia Tooke is our Instructor for this class and she is full of great energy so consider joining her on Mondays from 12:30-1:30pm for Zumba Gold. Another new addition to our lineup is the Chakra Yoga Class. One of our fabulous and long time instructors Pnina Shamsi is offering this class. This yoga class focuses on deeply stretching and strengthening the body, while incorporating and exploring many energetic balancing techniques. This class is moderate to vigorous in intensity, and some yoga experience is suggested. This class is offered on Mondays from 5:15-6:15pm. Nancy Yates has started a new class titled Stretch, Release, and Feel Better. This class Combines light to moderate stretching with a focus on releasing tension, mental and physical fatigue and letting-go of stress as a basis for healing and feeling better. This class is offered on Thursdays from 12:15-1:15pm. And lastly, we are now open on Saturdays with a Gentle Yoga Class taught by Stacey Singleton. Stacey is a long time Bay Area Yoga Instructor and is an excellent addition to our Instructor roster. Her class on Saturdays is from 8:30-9:45am. Breathe deep and stay connected! Mickey Kay takes a shot. 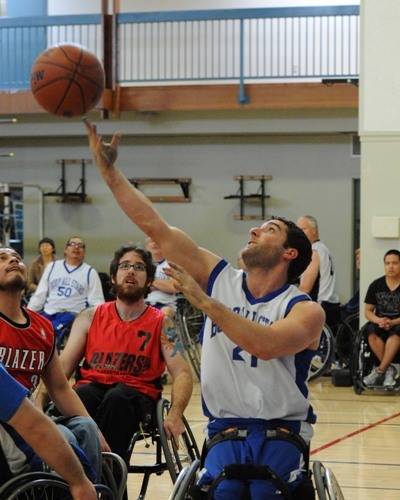 The BORP All Stars are hosting a wheelchair basketball tournament on March 17-18 at James Kenney Recreation Center, 1720 8th Str., Berkeley. In addition to the All Stars (BORP’s adult team) participating teams include the BORP Bay Cruisers (Youth Program Varsity), Sacramento Cagers, San Jose Spartans, Santa Rosa Blazers and the Shasta Lakers. Sam Marks getting ready to pass the ball. 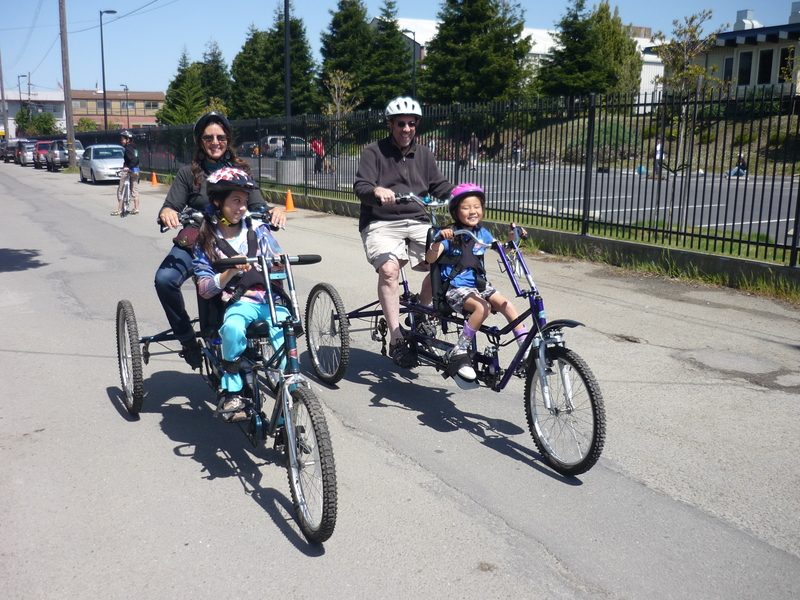 BORP’s Adaptive Cycling Center in Berkeley is open for group rides and independent riding and training. BORP has the biggest and most diverse fleet of adaptive bikes in the world! Over 65 handcycles, tandems, recumbent trikes, and therapeutic trikes are available in adult and youth sizes. No appointment is necessary during regular hours. BORP’s staff and volunteers can help you determine and adjust the best bike for you and get you on the road. We encourage our riders to come as often as possible. Over 30 miles of safe, mostly flat bike trails are accessible directly from our center. Ride on your own or join our social and training rides for independent riders at 10 am on Saturday. Or you can organize your own group meeting time and make it happen. Youth under 18 must be accompanied by an adult guardian or join our youth group rides which begin in May. See you at the bike house!